You are now leaving the Victoria Brown Financial Planning Limited website, and are being connected to a third party web site. Please note that Victoria Brown Financial Planning Limited is not responsible for the information, content or product(s) found on third party web sites. If you own a home, you will need home and contents insurance, but where do you start? The home insurance quote and buy service is provided by Source, who have been working in partnership with major UK home insurance brands for the past 23 years. 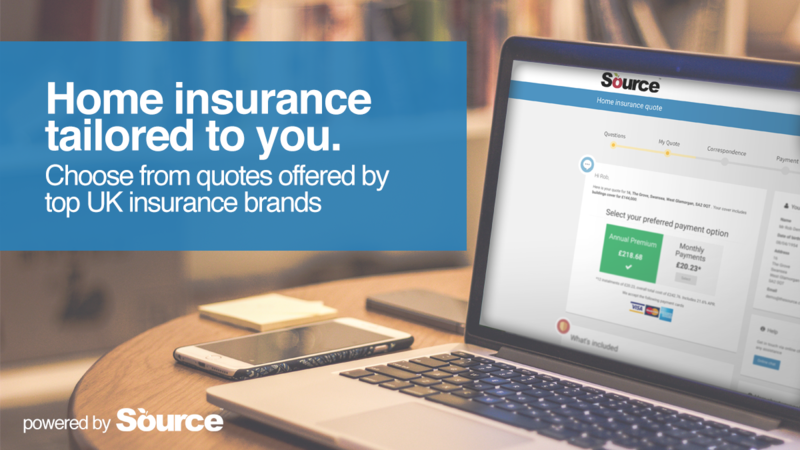 When you request a quote via this service, Source will search their panel of insurers for the policies that match your personal circumstances. By using a panel of insurers, you will have access to a range of cover and price options to choose from. With a quote from Source, the price you see is the price you pay and you can purchase there and then. The quote system is available to use on any smart device and will guide you through a quote to provide you with the reassurance the things important to you are covered. You can select from buildings only, contents or full buildings and contents cover. Quotes from a panel of leading UK home insurance companies. Select a policy that directly matches your personal needs and budget. Cover available to those individuals who find it difficult to get cover elsewhere. Cover for properties with specialist risks such as undergoing renovation, unusual build or design and many more. Documents are stored securely and accessed online via a ‘my policy’ area. At renewal, Source will automatically check to see if we could offer you a cheaper premium from our insurance panel. Support from Source’s UK based contact centre of insurance specialists. Victoria Brown Financial Planning Limited is registered in Scotland no. SC540131. Registered office, Pavillion 2, 3 Dava Street, Glasgow, G51 2JA.